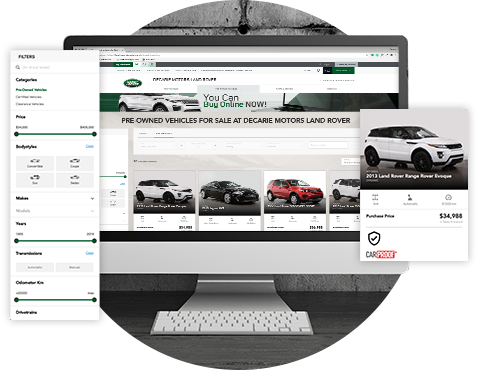 Decarie Motors Land Rover has created a fast and easy car buying process for you to experience from the comfort of your home. Experience the future of buying cars today. Add your cash down and determine your budget. Select and save your favourite vehicles. We reserve your vehicle for you for 5 days with a $1,000 deposit. Entirely online and get pre-approved now. From the confort of your home. Decarie Motors Land Rover takes care of the rest for you! Explore our inventory of luxury pre-owned vehicles, whether that’s from Land Rover or other premium brands. All certified pre-owned vehicles undergo a 165-point inspection to ensure they’re in optimum electrical and mechanical condition. Take advantage of the Land Rover Approved Certified Limited Warranty until your vehicle is 7 years old or until it reaches 160,000 kilometres. Any reconditioning work will be undertaken by Land Rover trained technicians using specific tools, diagnostic equipment, and genuine Land Rover parts. We offer our customers free delivery within the Island of Montreal. No matter where you’re located, we will make sure that your newly bought vehicle arrives safely and in perfect condition. Choose your vehicle today and have it delivered to your doorstep in no time!